If you ever spot a gray moth in your kitchen, watch out. The pest—known as pantry moths or Indianmeal moths—loves oatmeal, nuts, cereal, dried fruit, pasta, and other common dry good staples just as much as you do. Sure, they might seem cute at first, but if they start growing their family of critters, you’re going to be in big trouble. According to The Old Farmer’s Almanac, pantry moths—which typically get into your home from infested warehouses or bulk bins at your go-to natural food store—lay eggs (sometimes 400 at a time!) that hatch into larvae that look like tiny caterpillars. Unfortunately, the larvae loves nothing more than wreaking havoc on your life, chewing holes in both paper and plastic packages and spinning silk webs inside your containers. They don’t just hide in your food, either: they also hang out on the edges of cans or in the cracks or holes in shelves. Aside from the serious gross-factor of having these bugs in your food in the first place—no one wants a mouthful of wiggly larvae!—an infestation can also cost you hundreds of dollars. Once it occurs, you have to toss all your precious packaged goods into the garbage and get them out of your home ASAP. So the real key in stopping these moths from creating issues? Taking some cautionary steps to ensure they don’t even get the chance to in the first place. The next time you’re at the store, first make sure the packages and cans you’re putting into your cart don’t have any visible webs, holes, or larvae clinging onto them. Then after bringing everything home, the old hands at The Old Farmer’s Almanac suggest you put the dry foods (not cans!) into the freezer for four days at 0 degrees Fahrenheit or below to make sure any eggs that are present are destroyed. After the time is up, keep all your dry goods in airtight containers. 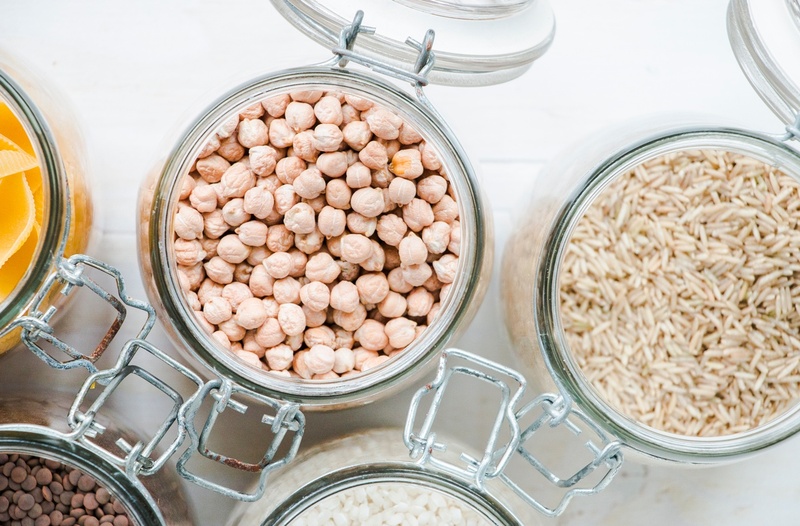 That way, your pantry won’t just be pest-free now and in the future, but it will also be nice and organized. It’s a win-win. Here’s a two-step, nontoxic routine to rid your plants—and home—of bugs. Or find out how bed bugs could be lurking in your dirty laundry.